X would like to thank all that participated in organizing, running and competing in this ground breaking event. 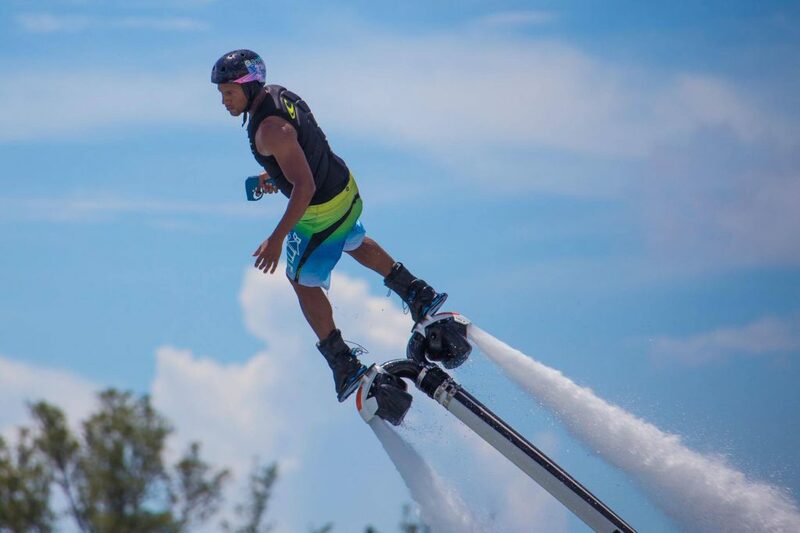 First of all, thanks go straight to Callon Burns, Bermuda resident hydroflier, one of the first global competitors in hydroflight, was the spark in putting all of the players together and generating the enthusiasm for sponsors and riders to travel to Bermuda for this epic outing. Not only did Callon work this event into happening, as a sponsored X-Jets rider, he competed on home turf and put in an epic showing for his hometown crowd and the gathered fliers. We look for Callon to be able to devote more of his energies to flying in 2018 and aim for a spot on the podium at the global events. Gretchen Vance brought the full range of her event managerial talent and coordination in conjunction with event organizers Savvy Entertainment to pull off the best run event in the history of hydroflight. Each aspect from promotion, website and competition rules and guidelines, jet skis, judges and judging was planned and followed through in meticulous detail by Gretchen and the Savvy Entertainment crew. Savvy has announced a timeline for future events in the this series and we look forward to the upcoming season of competitions and widening the world of hydroflight! Hydroflight is a machine intensive sport, relying on gasoline powered jet skis to provide the thrust needed to propel the fliers airborne. Everyone in the industry knows the challenges of maintaining jet skis in top running order. In a competition, in order to maintain an even playing field, this becomes even more critical. Kurt Binter and Malvin Quinones, the tech and mechanical support team did an amazing job. These two guys put performance and safety above all else and pulled out all the the stops with non stop attention to detail. Open events never are easy due to equipment changeovers between different connecting systems used by different manufacturers, Malvin and Kurt coordinated, changed, and dealt with all of the complexities in a stellar fashion. Great work guys, it was a pleasure to meet both of you and we look forward to working with you and your team in future events. Special thanks go to Bobby Vance for literally jumping into action to assist on the water marshalls boat in righting a few flipped skis. Jeff Elkins for stepping in where and when needed. Much respect to the team of Jetpack Invasion, Mike Helton, Sandy Burns, Ben Merrell, Mike Traster, Jeff Elkins, and support by Leslie Burns and Jill Helton, and lots of coordination in getting their gear on island and in place by Gretchen Vance. The night show was one of the highlights of the Battle, with spectacular illuminated flying coordinated both on motion and color by a sophisticated computer controlled, mobile, waterproof high wattage lighting setup. Unbelievable to see it in action entertaining the crowd, this group has (no pun intended), a bright future ahead of it! The judges, head judge Jason Gauthier, Adrian Boucher, Yang Dong Won, Paul Bulka, and Derek Crespi stepping up to judge objectively and fairly after a scheduled judge was a no show. All of the judges performed on point and objectively. Hats off the Jason Gauthier for fairly maintaining order and integrity. We all worked hard to provide a fair and transparent scoring environment, but the actions and attitudes of the judges are the key to the result. Jeff Elkins for his work on Flytronics, Liquid Motion Lights and Jetpack Invasion, and contributions to hydroflight. Jeff you are a talented visionary and it is a pleasure to work with you! Jill Helton for her amazing photography work and dedication to hydroflight and to increasing the cohesiveness of the whole hydroflight community. Team Canfly for representing that brand diversity can result in strength! Great showing by the largest team in hydroflight! We look forward to others following your example and building talented teams. The families of all of the atheletes that traveled to support their fliers, awesome proof that an athlete is not doing it along, it is with the support and encouragement of those around him or her. Jake Orel’s family, Hunter Verlander’s awesome support team, Amber Merrell’s support of her husband Ben is always impressive! Kevin and Gage Beam, Logan and Craig Foust, great fathers, nice to meet both of you, no doubt big things ahead for Gage and Logan. Mike Prince and Julie, wonderful to see you both in Bermuda! Bermuda, what a great island! So unexpectedly beautiful and enchanting. Beautiful geography and craggy coasts, for us almost a feeling like Thailand, however with classic architecture and muted colors schemes. A warm and welcoming people, from the immigration officers that were informed about the hydroflight event, to everyone else we met. Wonderful experience and we have been and will continue to share how much fun we had in Bermuda with our friends and customers! The sponsors for putting up the prize money of 10K, showing commitment and support to the riders. Much appreciated! For our part, Stratospheric, X, supplied the jet ski adapters and hose systems, 110mm Daytona black and white construction hoses and our Nose360 systems. We also created a customized version of our live scoring app, hydroscore, that was integrated with a live video feed for instantaneous score display on a big screen LED display, informing the viewing audience and the riders the live impression of the judges. Finally , X-Jets would be nothing without the dedication and trust of our team. In alphabetical order, Ben Merrell, Callon Burns, Gage Beam, Hunter Verlander, Jake Orel, Logan Foust, Mike Prince. You guys represent the qualities that we value, each one of you put great showings, and made all of us proud. All of the work on the gear, distills into your performances and our reward is seeing what you are able to write into the air with your flights. Thre is no reward greater than seeing you all fly! Flyboarders that participated, we know that the history of this sport has been fractious, we appreciate that you all took part and we have the feeling that a brighter horizon is ahead for all of us. It was good to meet you at the event and we hope that we will see you at the events in 2018, first stop Sharjah!